The Cosmo MX 2.0 is the newest roost deflector model designed to accommodate a neck brace. The Cosmo MX 2.0 features an ergonomic design that follows the natural shape of the rider's back and features a removable bottom plate to accommodate riders with shorter torsos. Preformed PE padding provides EN1621 Level 1 protection in the front, while removable and washable EN1621 level 2 certified back padding provides comfort and protection for the rider's back. 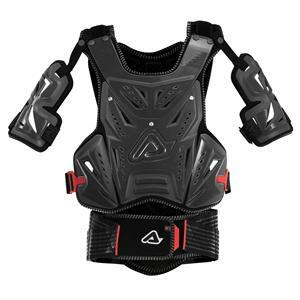 The Cosmo MX 2.0 also features a built-in kidney belt and d30 shock absorbing material in the spinal column area that hardens instantly on impact to absorb shock.